Jameson, Fredric, ‘Architecture and the Critique of Ideology’ , in Michael Hays(ed.) Architecture Theory Since 1968 (Cambridge, MA:MIT Press, 1998). 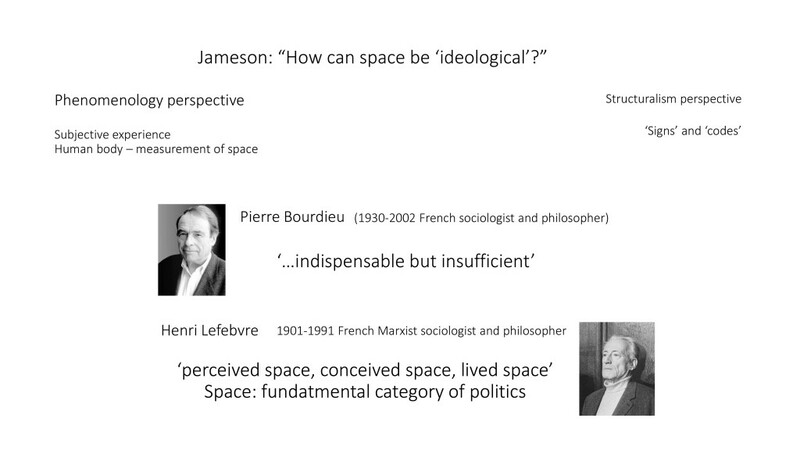 In his article, Jameson begins by a question “How can space be ‘ideological’?” He presents two different views on the question. One is from a naturalistic or anthropological perspective mainly based on human body itself, most notably in phenomenology, which is the study of subjective experience. In this perspective, human body, its limit and needs are the fundamental measurement of space. However, Jameson points out that this view is ahistorical, meaning that it lack of the dimension of time. The body in reality can be a social body which carries the whole historical range of social experience. And meanwhile, another French sociologist and philosopher Henry Lefebvre further developed his notion of space on three axes. Simply introduce them here as the ‘perceived space’ of everyday life, which is more close to the phenomenological concept, the theoretical ‘conceived space’ of urban planners or architects, and the third ‘lived space’ of the imagination with can be associate with art and literature. The conception of space for Lefebvre is as a fundamental category of politics. However, this position is what Tafuri repudiates. Politics is radically disjoined from aesthetic (architecture) practice. Architects can therefore be political, but their architecture today cannot be political. An architecture of the future will be concretely and practically possible only when the future has arrived, that is to say, after a total social revolution, a systemic transformation of the mode of production into something else. Jameson believes Tafuri’s position refuses the possibility of some properly Marxian ‘ideology’ which would seek to project alternate futures. Tafuri commits to a resolutely critical and analytical Marxian ‘science,’ while ‘denouncing the ideologies of the past and of a closed present.’ However, Jameson argues that one does not get out of ideology by refusing it or by committing one’s self to negative and critical ‘ideological analysis.’ Thus Tafuri’s position is also an ideology. Jameson then examines Tafuri’s work Architecture and Utopia in three distinct perspectives. Jameson begins unpacking the first aspect which is to do with historiography. A crisis in narrative or storytelling history has happened since the end of 19th century.. One side of the views is that while the narrative representation of history tends to suggest that history is something one can see or be present at, it is quite obvious that it is a false proposition. (meaning – you can never see or experience history in person no matter how cloesly it might be represented) On the other hand, the word history itself (history, story) has suggested that storytelling is a fundamental part of it, so narrative is always embedded in its very structure. Facing this dilemma, Jameson himself favors Louis Althusser’s solution, which proposes that ‘historian should conceive her task not as that of producing a representation of history, but rather as that of producing the concept of history.’ To achieve this, one has to return to a dialectical tradition. 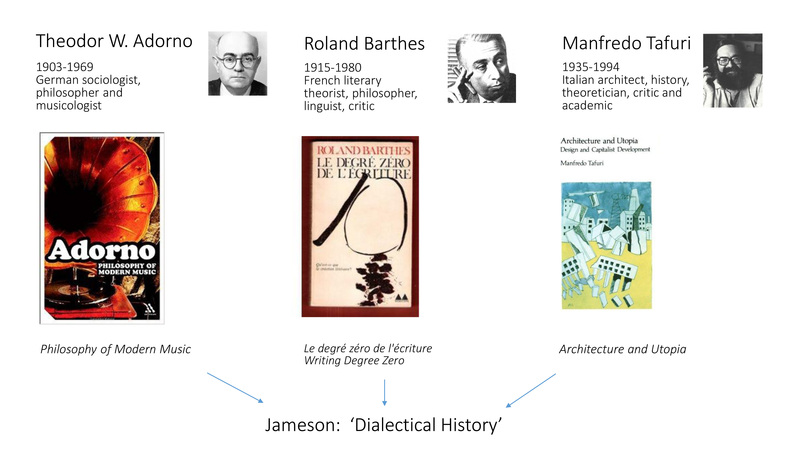 To Jameson, Tafuri’s Architecture and Utopia deploys a dialectical critique. From this perspective, Tafuri’s book has produced the ‘concept’ of a dialectical history of architecture. In other words, the concept rather than a narrative representation of architecture. Jameson put side by side Tafuri’s Architecure and Utopia with T.W. Adorno’s Philosophy of M Modern Music and Roland Barthe’s Writing Degree Zero. While the three writings are in different subject, namely architecture, music, and literature respectively, the thing in common among them is what Jameson called ‘dialectical history,’ which can be regard as a kind of ‘textural genre.’ It has a condensed, allusive and discursive form. There is an organizational framework shared by the three text which makes practicing dialectical thinking possible. It is the sense of Necessity, of necessary failure, of closure, of ultimate unresolvable contradiction and the impossibility of the future. You already have a sense from these words that it could be very negative and discouraging. Taking the example of Adorno’s writing of musical history, his discussing culminates in Schoenburg’s extraordinary ‘solution’ which solves all the dilemmas outstanding in previous musical history. But it is so completely as to make all musical composition after Schoenburg superfluous. In Barthes’s case, his ideal of ‘white writing’ is, to Jameson, ‘an impossible solution to a dilemma that rendered all earlier practices of writing or style ideological and intolerable.’ And finally, Tafuri’s account of the ‘increasing closure of late capitalism, systematically shutting off one aesthetic possibility after another.’ This ends up conveying a hopeless and suffocating sense of futility of any innovation of architectural and urbanist approach. Tafuri’s dialectical history refuses a type of criticism, which he called ‘operative criticism’ in his book Theories and History of Architecture. This type of criticism ‘reads the past selectively and places an illusory historical analysis, which may appear to be objective historical narrative. But in fact it is to the project of future work and possibilities. In the architectural realm for example, this could be an architectural manifesto, a projection of new style. Tafuri’s refuses this type of criticism because he argues that analytical rigor is substituted by ‘ready-made judgment of value,’ which is prepared for the sake of immediate use.’ However, Jameson argues that the ‘rigorous analytical history must in turn be bought by a stoic renunciation of action and of value,’ and almost a renunciation of possible futures. Therefore, before even examining the content of Tafuri’s writing, the ‘formal necessity of the generic structure of his text,’ namely dialectical historiography, has already doomed to determine the ‘pessimistic’ tone. But next, Jameson begins to examine the content, or Tafuri’s opinion itself, which intersects with the formal and textural necessity mentioned before. Tafuri’s position is examined by Jameson under a Marxist context, in which the book Architecture and Utopia is produced. One significant feature of Marxist theory is the total system. It is marked by ‘a global deployment of capital around the world, and effectively destroying the order coherence of the various national situations. It is also marked by the dynamism with which the Unconscious is penetrated and colonized by Culture Industry, for example, that is ‘media, mass culture, and the various other techniques of the commodification of the mind.’ Another feature of the of the theory is that the expansion of late capitalism ‘triggers various new forms of struggle and resistance, it tends to be accompanied by a mood of pessimism and hopelessness that accompany the sense of a total system, with nothing outside itself, within which local revolts and resistance come to be seen, not as the emergence of new forces and a new logic of a radical different future, but rather as mere inversions within the system.’ This system is regarded by Jameson a closed system. The key feature of it insists on a classical notion of Marx, ‘namely that a socialist revolution and socialist society are not possible until capitalism has somehow exhausted all its possibilities, but also not until capitalism has become worldwide and global fact.’ This all-or-nothing position is reflected in Tafuri’s work. 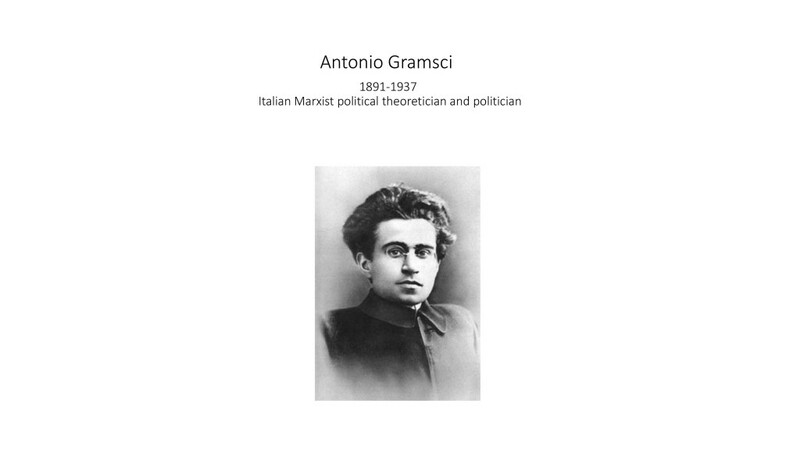 He translates his Marxian approach to architecture and its relation to the city: ‘There can be no qualitative change in any element of the older capitalist system-as in architecture of urbanism- without beforehand a total revolutionary and systemic transformation. So what can be an alternative way out? 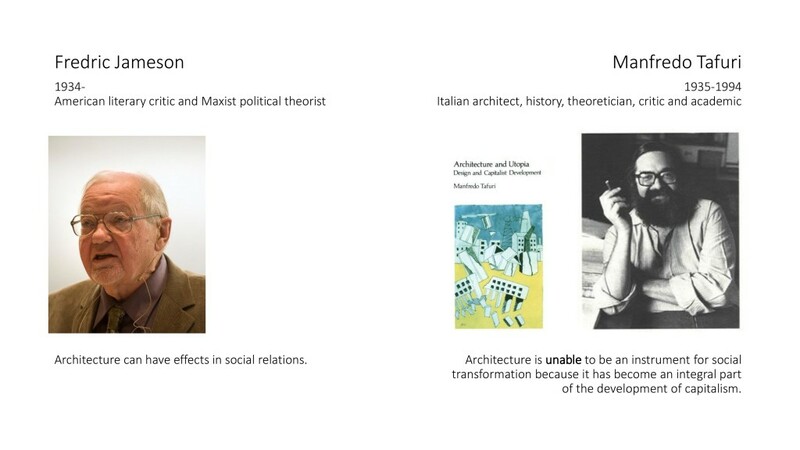 And do architecture and urbanism really play no useful role in social transformation?